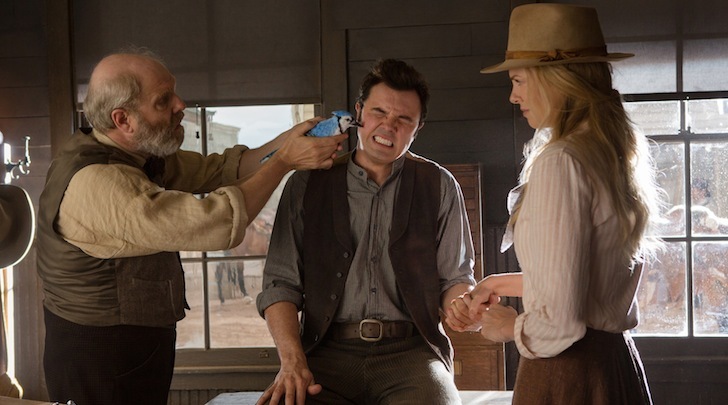 Movie Review: A Million Ways to Die in the West (2014)- Seth MacFarlane’s Second Comic Venture is an Uninspired Comedy Filled with Numbing Vulgarity and Aimless Joke Precision | Generation Film! Our accumulated knowledge at our disposal in present day versus the dearth of knowledge in the past has always been a clever tactic that numerous comedians and comedic films have taken advantage of, including Woody Allen in his Russian Czarist age comedy Love & Death, Monty Python’s outlandish mockery of Medieval Times in Monty Python and the Holy Grail, and especially in Mel Brooks’ indictment of the backwards west in his satirical western Blazing Saddles. Not every comedy that wishes to satirically criticize history or mock the cultural normality of a time now past can equal the standard of the aforementioned films, especially with a film such as Blazing Saddles which practically defined the western satire to the point where followers could never surpass its comedic brilliance. Sitting comfortably in the Top 10 of the American Film Institute’s Top 100 Comedies of All Time, Blazing Saddles became a comedy well ahead of its time because of its uninhibited blend of racial stigmas, a shameless acceptance of silliness, and a clever usage of pop culture references. It seems writer/director Seth MacFarlane became blinded by the high of having a successful comedy that exceeded low expectations with his first comedic feature Ted that he felt confident enough to attempt a modern age Blazing Saddles with A Million Ways to Die in the West that bites off more than it can chew. A Million Ways to Die in the West mimics the presentation of Mel Brooks’ classic satire filling itself with offensive racial observations (Asian railroad workers, Slave humor), relatively clever pop culture usage (Back to the Future, Django Unchained), a mockery of western cultural conventions (whores, the religiously devout, gunslingers), and silliness to spare but unfortunately fails to link these varying dynamics into a successful comedic experience. To put it in Western terms Seth MacFarlane isn’t a comedic gunslinger that aims precisely where he means to landing each joke with a clever purpose but is instead a shotgun firing recluse in the wilderness where an occasional brilliant comedic hit is lost in the spray of aimless and exhausting uses of vulgarity and adolescent antics that are more immature than they are clever. Seth MacFarlane’s latest comic venture can’t exactly be described as funny because it hides its incompetent desperation with a frat egoist’s smugness that’s typical of all MacFarlane’s hit or miss creative feats from Family Guy to American Dad to his last surprising success Ted. Might you enjoy A Million Ways to Die in the West? The answer could be a potential yes in the same way that you might enjoy an arguably shameful one night stand which just means you get momentary pleasure in exchange for a regret cleansing shower afterwards. MacFarlane as a writer has always been a comedian of gimmicks rather than a comedian of expression because he really doesn’t have a purpose for his comedy except of course to make himself and his devoted cohorts laugh in inside joke amusement. All of his shows from Family Guy to American Dad to The Cleveland Show all share the same comedic foundation of uninhibited ridiculousness distracted by epileptic deviations into pop culture madness that tend to never make sense (South Park highlighted this better than anyone else could). It’s no wonder that A Million Ways to Die in the West feels a bit empty in creative inspiration considering the three screenwriters devising the plot and comedic antics are Seth MacFarlane himself accompanied by Wellesley Wild and Alec Sulkin the creators of the thankfully canceled TV show Dads which should have been brought up on comedy murder charges if we had an actual reliable justice system. The whole premise revolves around a lackluster sheep farmer named Albert Stark (again, Seth MacFarlane) who clearly was born in the wrong time period as he waxes poetic about the limitations, horrors, and complete madness of the western time period almost as if he was a modern man who time traveled to the dangerous time of the American west. This cowardly sheep farmer willing to end things amicably instead of participating in the ritualistic killing of gun slinging to solve differences must find his inner courage when he’s forced to face a notorious gun slinger named Clinch (Liam Neeson) with the help of Clinch’s estranged, beautiful wife Anna (Charlize Theron). Comedic gimmicks are essentially the only weapon in MacFarlane’s arsenal as he oversaturates the screen with gross out antics, including a plethora of diarrhea in a hat, a sheep’s erect package relieving itself in someone’s face, and an Indian quest dream sequence that seems to be an adolescent college boy’s descent into over the top immaturity. Really the only jokes that do inevitably work are the great selective cases of highlighting the west’s backwards time such as the depressing nature of not smiling in photos, the incompetent doctor and the lack of genuine medicine, and that having a mustache was a rich man’s hobby. These examples are rare throughout the film along with the surprising lack of actual ways to die in MacFarlane’s satire that actually has only nine ways to die in A Million Ways to Die in the West. MacFarlane, Wild, and Sulkin’s script ultimately becomes a simplistic example of a satirical framework that tries to borrow the best of Blazing Saddles while also integrating MacFarlane’s personal brand of immature chaotic humor that exhausts more than it humors. Any genre satire requires a director and technical team that truly understand the aimed genre’s storyline conventions, visual style, and repeated themes in order to turn them on their head for a sharp comedic presentation much like Airplane did with disaster films from the 60s and 70s and what Black Dynamite did with Blacksploitation films. Because MacFarlane is a pop culture student of live action and animated television over numerous decades a great deal of comedic possibility is lost on his lack of understanding of Western cinema as he never really tries to satirize westerns of the past nor does he poke fun at the visual landscape at his disposal minus an opening credit sequence utilizing Monument Valley. Blazing Saddles mocked Western cinema conventions from the heroic stature of Randolph Scott to mocking overused clichéd phrases (“We’ll head em’ off at the pass) that showed off that Mel Brooks and his writing team understood the Western as a cinematic medium and poked fun at it with a comedic artistry not really found in today’s theaters. This lack of understanding of the Western permeates MacFarlane’s A Million Ways to Die in the West that survives on the aforementioned silly gimmicks that makes it a comedy of limited scope never aiming to utilize its surroundings more than just as a way to make obscene jokes and showcase brutal deaths (of which there aren’t more of and none of them are entirely that clever). As a director of comedy MacFarlane finds his moments of humorous stride as he executes some jokes well despite an uneven pacing of vulgar humor to resoundingly stupid humor to weird dramatic deviations in the storyline either between Albert Stark (Seth MacFarlane) and Anna (Charlize Theron) or Anna and Clinch (Liam Neeson). Nothing flows particularly well and it’s mostly because MacFarlane treats his script and set up jokes as a testing ground where he launches untested inside joke material at an audience barely able to comprehend the barrage of ill-thought out concepts. If MacFarlane had taken the western in its cinematic uniqueness seriously it would have given his technical team a chance to play around with the conventions making it a humorous environment heightening his intended criticism instead of making the film seem visually bland and genre deficient (it’s only a western in a very shallow sense). Luckily MacFarlane had a cast that can often times transcend bad material except of course for the uncomfortable and awkward fact that he’s right in the middle of that mess as well. There’s no doubt that MacFarlane has a talent for voices even though it might only be three to five unique voices considering he uses them repetitively to bring numerous characters to life where the dirty minded, drug using bear Ted sounds exactly like the affable, stupid Peter Griffin in Family Guy. MacFarlane uses his normal voice, or rather the voice of Brian the dog from Family Guy,in A Million Ways to Die in the West making the mistake that we enjoy his soothing tones enough to let him get away with being a miserable choice as a comedy lead in physical presence. It takes a great deal of misguided courage to host the Oscars and mock the Hollywood elite of actors and then get up on the screen to take control of an entire picture yourself and it appears MacFarlane made it really easy to be continuously mocked for his lackluster performance in his own film. Luckily MacFarlane surrounds himself with some fairly competent actors, comedians, and charismatic people to disguise his graceless efforts on the screen but that isn’t enough to sell the bad jokes and the exhausting presence of MacFarlane’s smug immaturity. Surprising as it seems to see Charlize Theron in this sort of role it was almost required to get an actress of her caliber to sell the all uphill task of being sexually attracted to Seth MacFarlane which she does without appearing physically disgusted by the job. Liam Neeson hams it up in typical Liam Neeson style but it’s also a source of comedy that wasn’t successfully utilized leaving a dearth of potential Neeson jokes (look up his cameo in Rocky Gervais’ show Life’s Too Short to see his satirical play on self). One of the comedic highlights is the repertoire between Giovanni Ribisi and Sarah Silverman as a religious couple where one of them is also a whore (guess which one) but that too only brings us minor inspired moments in a script devoid of clever humor. Seeing Neil Patrick Harris on the screen will always inspire a smile but there’s no doubt that his talent was completely underused except through MacFarlane’s best contribution to the film in the form of a catchy Mustache song which wouldn’t have worked without the incomparable NPH. Random cameos also became an odd highlight mostly because seeing Ewan McGregor say one random line in western attire, Ryan Reynolds getting randomly shot for nothing, and Gilbert Gottried as Abraham Lincoln just add to the successful but lacking silliness aspects of MacFarlane’s film. All the actors showcase that it was the lacking material that makes A Million Ways to Die in the West a comedic bore and not their lack of ability to humorously bring it to life because they all have showcased better comedic potential in the past. Is it fair to compare MacFarlane’s second cinematic feature to the impeccable quality of Mel Brooks’ classic western Blazing Saddles? Of course it isn’t fair but since there aren’t too many comedy westerns that attempt to satirize the time period and genre it’s understandable we use that as a standard to hold it to. Not only does A Million Ways to Die in the West lack in its ability to capture an equally humorous observation of the past but it also lacks original comedic creativity to make it a comedy worth venturing on its own right as it tires us out with expected vulgar humor and confuses us with choppy comedy film pacing. MacFarlane clearly allowed the surprising success of Ted to inflate his already enlarged smug persona which just means he didn’t really take this latest comedic venture seriously in joke intention, satirical criticism, or in being an auteur comedian. There’s a reason MacFarlane won’t reach the quality level of similar comedy writers/directors such as Woody Allen, Mel Brooks, or Edgar Wright because he simply doesn’t understand the foundation of where he starts to build on for his comedic experimentation. MacFarlane’s mind drifts in one direction and that is with the typical and exhausted avenue of vulgar, gross out humor that becomes so expected that it doesn’t hit as hard as it once did making his comedy seem uninspired and dated. Simply put, A Million Ways to Die in the West isn’t a great western satire nor is it even a relatively good comedy since it repeats comedy conventions we’ve seen all too often and executed with far better gun-slinger precision.